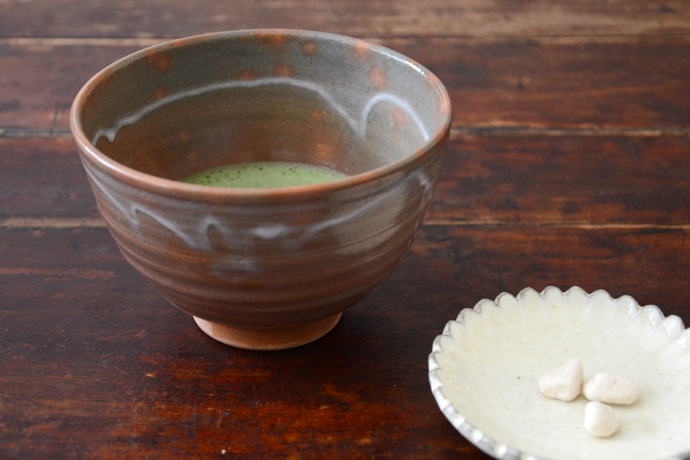 An Asahiyaki tea bowl with kase markings. This bowl uses clay that is high in iron and is also called benikase, or red kase. 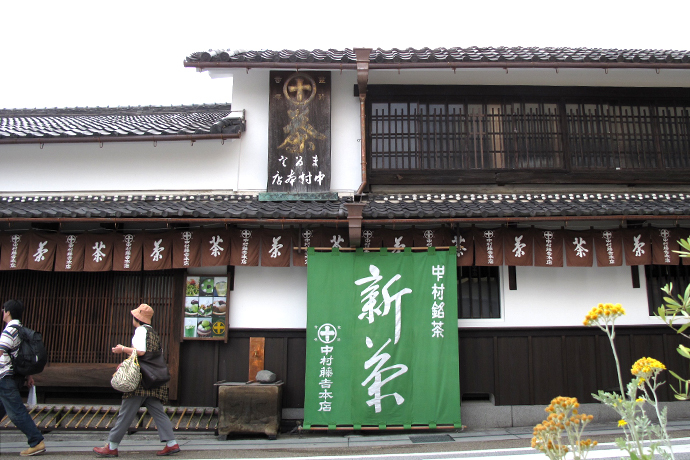 I had never heard of Asahiyaki, but a quick search revealed that it is a small pottery kiln located in the city of Uji, just south of Kyoto. With my curiosity piqued, I decided to pay a visit to Uji during a trip to Japan this past spring. Located between Kyoto and Nara, Uji is easily overlooked by its larger and more famous neighbors. 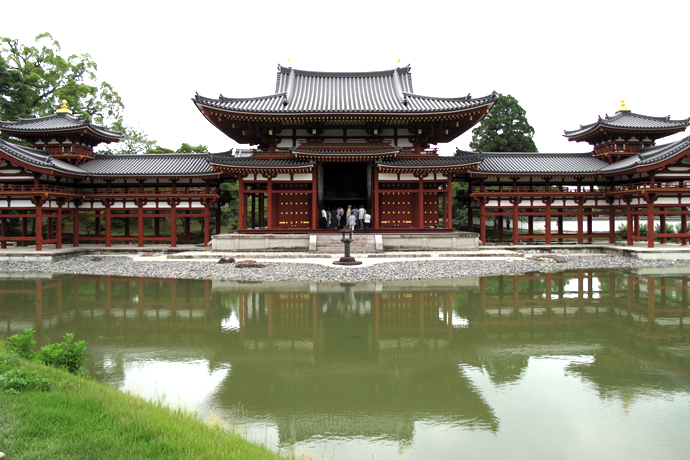 It is only 15 minutes by fast train from Kyoto and its most famous sight is the old Buddhist temple of Byodoin, which is designated as a UNESCO World Heritage Site. 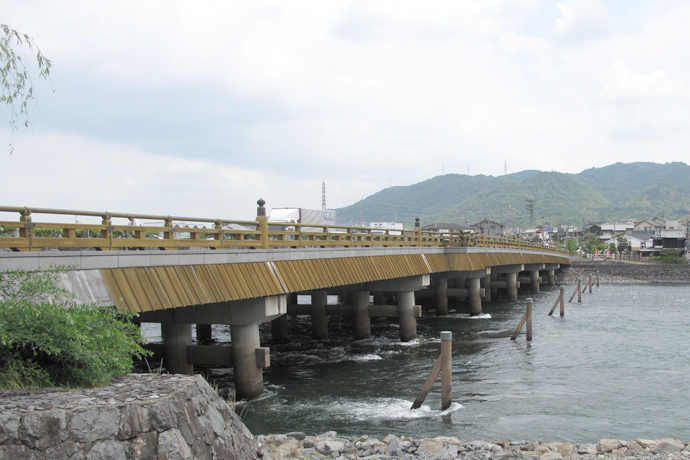 The famous Uji bridge is said to have been first built in 646, and rebuilt countless times subsequently. It is mentioned in the classic ‘The Tale of Genji’ written by Murasaki Shikibu in the early years of the 11th Century. In the tea world though, Uji is a heavyweight and its name is associated with green tea. Uji tea has long been renowned for its high quality and fragrance, and what this translated into during the warring states era of Japanese history was, power, privilege, intense rivalry, and… traffic jams. During the Edo (1603–1868) era, the Tokugawa Shogun in Tokyo demanded the first tea to be delivered from Uji annually in a tea-jar procession or ochatsubo dochu. These tea jars were given the highest status and wherever the procession went, all the common folk were required to stop whatever they were doing and kneel to the ground in reverence. They were also not allowed to overtake this procession as it made its slow, snobbish way to Tokyo. This most likely created the first-ever seasonal traffic jams in Japanese history. A sign at a Uji tea shop depicting a tea jar.Uji is only about 20 miles west of the pottery town of Shigaraki, where many tea jars were made. Not only were the ordinary public inconvenienced annually by these tea processions, but they also had no access to the tea as this was considered to be a precious commodity only available to the ruling elites. 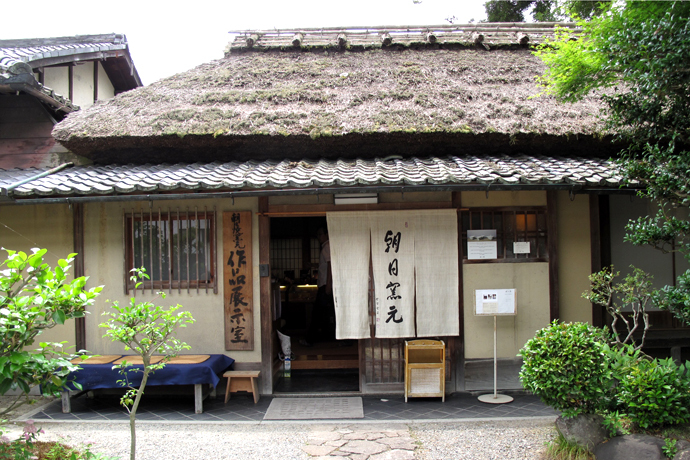 In today’s more egalitarian times, tea is available to all and when I set foot in Uji on an extremely hot day in early June, I enjoyed the sheer pleasure of walking through streets lined with tea shops. Many of them were advertising tea from the first harvest of the year that had just been released. I walked along the north bank of the Uji river past the Ujigami Shrine and this led me to the Asahiyaki pottery, where my earlier affinity with my teacher’s tea bowl had inspired me to travel to Uji. 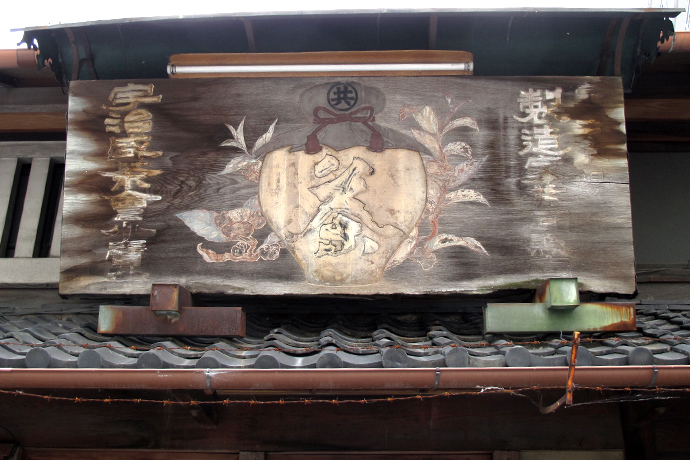 The Asahiyaki pottery is housed in a building with a thatched roof and a tasteful fabric sign. At the pottery’s gallery, I was met by Matsubayashi Toshiyuki, the son of the 15th generation Matsubayashi Hosai currently in charge of the 400 year-old kiln. Toshiyuki-san explained that Asahiyaki pots are made from clay that is dug locally and matured over many years, sometimes for more than a century. The pots are thrown and fired in a traditional wood-firing kiln. The distinct spots are called kase, which means ‘deer back’ because it resembles the back of a baby deer. The markings are created when the pots are repeatedly exposed to reduction and oxidation in a single firing. I told Toshiyuki-san that the gentle form of these pots was especially intriguing. He explained that it probably stemmed from the distinct method of throwing in which a stick is used to turn and create the momentum on the wheel. “The wheel only turns for a limited amount of time with force and the revolution becomes slow very quickly which creates a distinct gentleness,” he explained. As I left Asahiyaki pottery, I thought that gentleness is indeed the most appropriate word that captures what Uji is about, perhaps together with a little sense of melancholy. This maybe because I had read that Uji’s name originated from the Japanese word ushi, which means sorrow. Or conceivably it was from the historical depiction of Uji in The Tale of Genji -required reading during my school years- where the forsaken in life were exiled. For the next several hours, I strolled around the river bank visiting small shrines and popping into several tea shops. At Rishouen tea shop –recommended by my hosts at Asahiyaki- the kind owner offered me a taste of single origin Uji tea, produced only in limited quantities. When I finally arrived at Byodoin temple, the highlight for most visitors to the area, it was already late afternoon. I had come to the temple with little in the way of expectation as I had already previewed the building countless times featured on the back of the 10 Yen coin. The famous bronze phoenix on top of the temple roof is also on the 10,000 Yen note, which I see far less often. But when I saw the temple, I was stunned by its sheer exquisiteness. 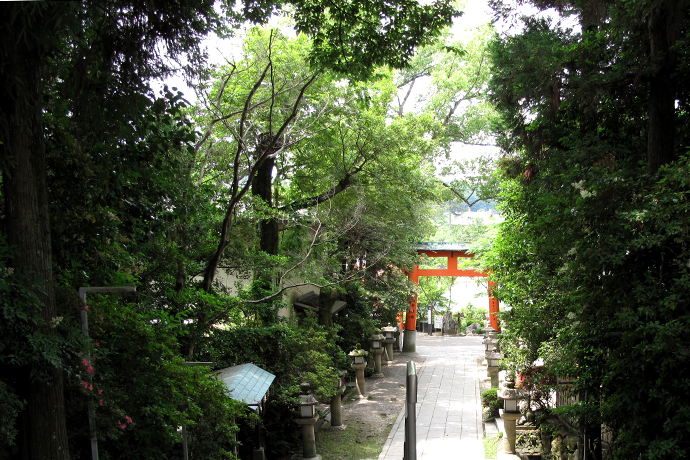 The temple was built in 1053 by Fujiwara no Yorimichi, a powerful noble who lived in the late Heian (794-1185) era. It was constructed to represent a tranquil paradise that the Heian Buddhists dreamed of after death, the heaven on earth imagined by people weary of all the turmoil they endured towards the end of an era. Magnificent colors had been restored in recent repairs to the temple, and the hues seemed to heighten the temple’s sorrowful beauty in the late afternoon light. San-no-ma of Uji bridge, the part of the city’s famous bridge where water is drawn every October for Uji’s tea festival. It is said that Toyotomi Hideyoshi, the 16th Century daimyo and the country’s second great unifier, had water drawn from the same river for a tea ceremony. As I left this unexpected paradise and walked back towards the train station, I wished that more buildings had survived from the Heian era. 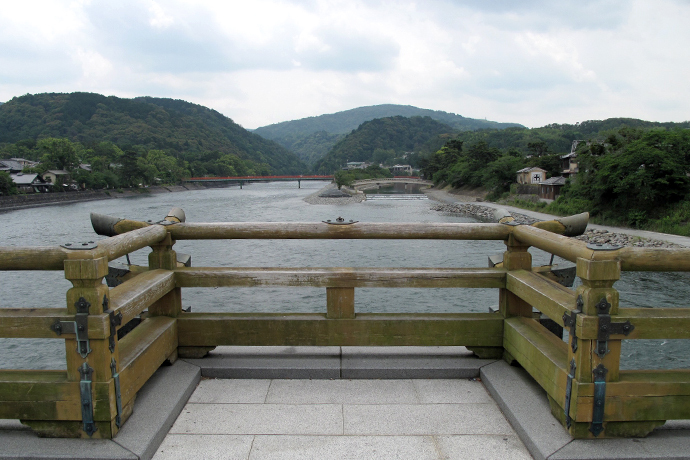 I even ambitiously thought that it would be interesting to visit Uji again after revisiting The Tale of Genji. If you are ever in Kyoto, I highly recommend that you make the time to visit the quietude of Uji, take a sip of the acclaimed tea, and glimpse the tranquility of a bygone era.